Android is now updated with the latest version Android 6.0 or simply call it as Marshmallow. Since its release, most of the android users are looking for this new android version. The latest android version is now available across many platforms like Nexus, Xperia, Samsung, LG, and many more android based devices. People nowadays love to try out new things rather getting stuck to one thing. And the same goes with android launcher apps. Though the android devices come with default android launchers, users go with different launchers for a better experience. And now that latest version of android, Marshmallow is on heat, android users are looking for the update and trying out different Marshmallow app launchers for their android. Based on Google android M theme, there 7 best app launchers for Android 6.0 Marshmallow for a better experience. The most preferable launcher app is Marshmallow launcher due to its user-friendly interface and is pretty stable due to the fact that itâ€™s built around the Google launcher. Hide your apps too with this launcher. Download the app to transform your current home screen into Marshmallow look. After installing this app, you can customize it accordingly by going to drawer setting from launcher setting. The popular launcher app first designed for Lollipop has now been updated for Marshmallow too. The app is cool, smooth, and powerful. 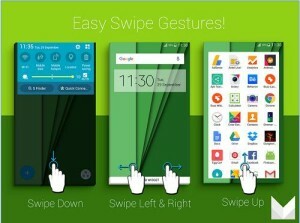 It too provides gestures and app hiding features. Android M card style drawer brings you a better experience of android. 5000+ icon themes and wallpapers to choose from. Get the android 6.0/M theme with this launcher. Download this app on your android devices irrespective of the OS running (Lollipop, KitKat, Android 4.0 or above) to get android 6.0/M experience on your android. The launcher app comes with additional features along with amazing features like scroll app drawer, smooth animations, swipe gestures, and many more to explore. Download the app to get the similar Android M launcher experience on your device with enhanced features. 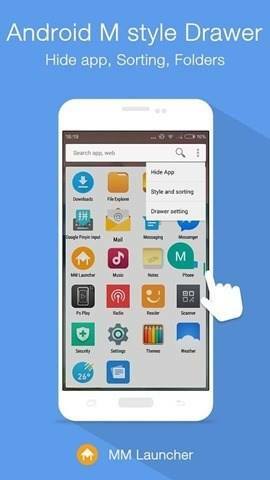 Android M launcher with high customization is yours M M Launcher. Along with quick toggling feature have a look at the number of customizable options too coming with this launcher app. Just like Android M Launcher, this too supports app drawer: in the vertical style, app locating animation, quick a-z side bar, and many more. Lightning fast, super light, Android M style launcher â€œPicoo Launcherâ€ can be best for your android device which comes with a full material design. Experience similar Android M style drawer and fast and smooth animations with this launcher app. So now choose the best one for you and have the experience of latest Marshmallow style launcher with these launcher apps.